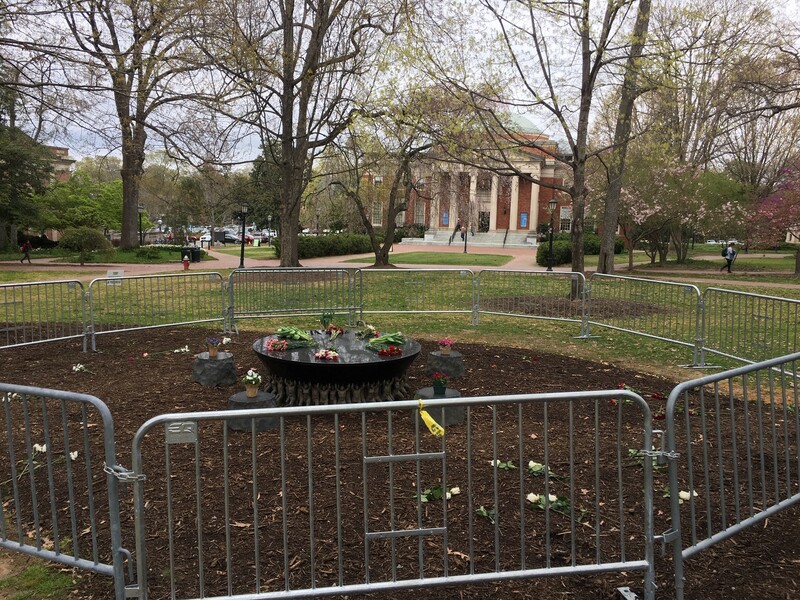 Two middle-of-the-night acts of vandalism against art objects on March 31 — including the Unsung Founders Memorial on McCorkle Place — were “racist actions,” said Interim Chancellor Kevin Guskiewicz in a message to the campus community. Two arrests have been made in the incidents. 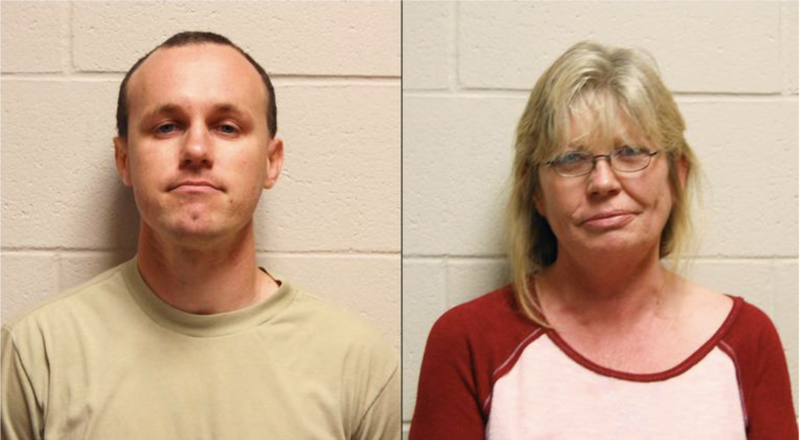 On Monday, UNC police arrested Ryan Francis Barnett, 31, of Sanford; and Nancy Rushton McCorkle, 50, of Newberry, S.C. Barnett was charged with vandalism, ethnic intimidation and public urination. McCorkle was charged with vandalism and ethnic intimidation. A criminal summons also was issued to both for the theft of a flag from atop the Spangler Building, headquarters of the UNC System on U.S. 54 near the campus, on that date. Both have received a warning of trespass from UNC Campus Police. Both are to appear in court in Hillsborough this month. The Unsung Founders, a sculpture in McCorkle Place near Graham Memorial and Alumni Hall, is the class gift from UNC’s class of 2002 and was installed in May 2005. It is dedicated to the people, enslaved and free, who labored to build the foundations of the University. It is a short distance from where the Confederate monument Silent Sam stood. Guskiewicz wrote that one of the people sought by police “is known to be affiliated with the Heirs to the Confederacy,” a pro-Confederacy group. Those who wanted the Confederate statue removed from the campus and those who support it have clashed numerous times, sometimes violently. The Confederate statue was pulled down by protesters in August 2018, and then-Chancellor Carol L. Folt ordered its pedestal removed as she announced her resignation in January. Members of the UNC System Board of Governors and the UNC trustees are deciding Silent Sam’s fate, with what is now a May deadline. The police report said the March 31 incident involved “weapon/tools” but did not elaborate. 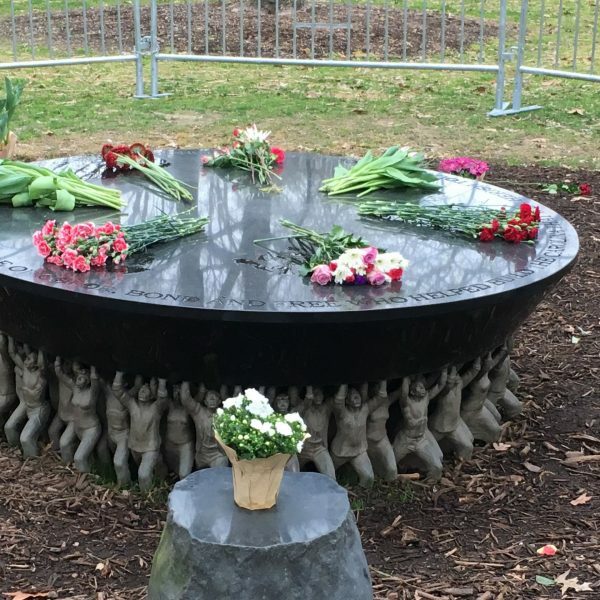 The McCorkle Place report said $200 in damage was done to the granite table that is part of the Unsung Founders; a second report said damage to the artwork at Hanes Art totaled $150. Damage to the flag was listed at $585. Barnett and McCorkle were not armed on March 31, according to police. In the latest incident, the person referred to as a Confederate supporter was identified on surveillance tape. The University has surveillance cameras on McCorkle Place and a regular police presence there, according to police spokesperson Randy Young. Young said barricades previously removed from around the Unsung Founders have been put back to deter such incidents. The March 31 incident in McCorkle was seen by a police officer, and the Hanes incident was reported by a passing motorist. Police said they would not release details “that could impede that investigation or subsequent prosecution,” including the content of graffiti. He said he had initiated a review of the March 16 incident. Read “A Song for Those Who Built Carolina,” about the origins of the Unsung Founders Memorial, in the July/August 2005 Carolina Alumni Review.